The mug gets our excitement! We had a huge reason to celebrate today – Chez Monique’s. This little arrangment of chairs on the sand served some mighty fine bacon and eggs…. and the best coffee!! Perhaps also the most expensive. The 2 eggs and 3 strips of bacon were $15….. worth every penny! For the record- having power over the tides is not one of the many benefits of using hiking poles. Crossing precarious logs through mud holes on the other hand is – and this is a much more practical use. I kept imagining what it would be like to fall into one of these blackholes of grime and sludge. I pictured an odd combination of the horse being sucked to its death in The Neverending Story and a bug stuck on its back flailing to get up again. Either way, not a pleasant picture. It’s amazing how over a span of 70km you go through so much different terrain! Today we got introduced to two very exciting new challenges – surge channels and huge boulder fields – the latter being Sonia’s arch nemesis. I quite enjoyed (seriously) being able to practice my rock-climbing techniques dragging myself up and over some massive rocks. 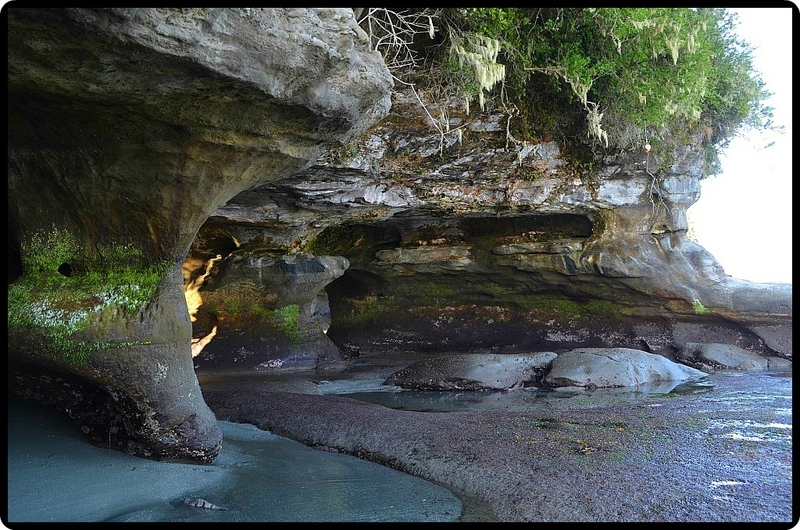 Although the beach route was a challenge today, I would highly recommend taking it – the rewards are some amazing sea caves formations at Owen Point. Be warned though – some creatures live here. 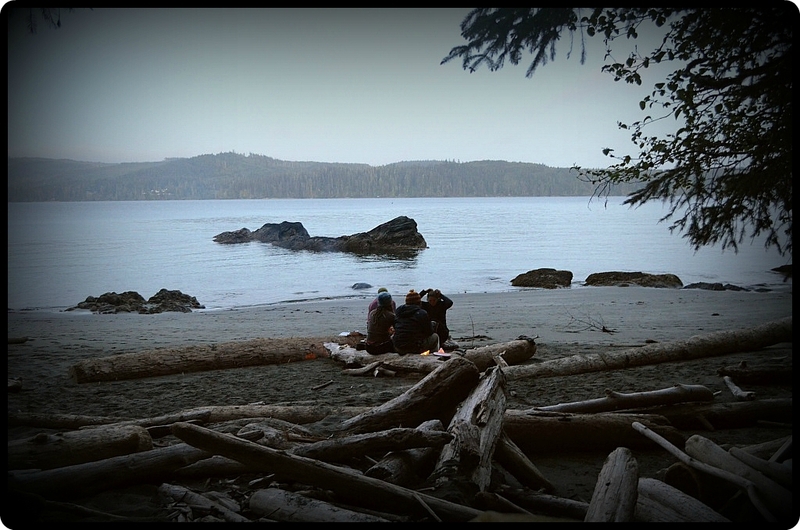 We were the first people through so got to see pristine animal tracks in the sand. I talked myself into believing they were cougar tracks leading in (and not out) of a wood pile at the back of the cave. I was shaking in the knees even before I heard the rustling and animal noises emitting from that corner……. Shortly after though, we walked right into a bear, a real, live, in-the-flesh bear….. and I handled the encounter much more like the bush-girl I was born to be……. I just said Hello Mr. Bear loudly, and backed slowly to where Sonia was. We then made a raucous trying to get the bear to turn around, and upon realizing he could not escape into the woods (there was a cliff), we went way out onto the beach to give him room to pass us on the inside. For good measure, I got my multi-purpose hiking pole out of my pack and brandished it at him with fury. I later jumped out of my boots when I heard a humming bird. Again I thought it was a cougar. I might have a bit of a cougar problem. We woke at the crack of dawn this morning to make shuttle back to Bamfield at 12:30pm. The last stretch was not nearly as hard as I was expecting. Yes there was more elevation gain than we had encountered so far – but really the amount would make seasoned hikers laugh (I am by the way not a seasoned hiker – on my way I’d like to think…). We made it to the Gordon River Trailhead (aka The End!) by 11am… plenty of time for our bus….. BUT …. BUT…. The next bus to Bamfield was in two days from now at 8:15am. We buggered it up. At least we had both come to the conclusion there was a bus at 12:30 independently so we could not place blame on each other. We sat and contemplated our options. There was a bus to Victoria at 4:30pm, which worked for me – despite the fact I would be without car for awhile – but Sonia desperately wanted to be back on the mainland that night. We had a bite to eat and then spent an hour or two trying to hitchhike out of town. No success. We had two very friendly locals offer us rides around town though. On the upside, we got to have one last coffee with our new friends from along the trail as we waited for the bus to Victoria. 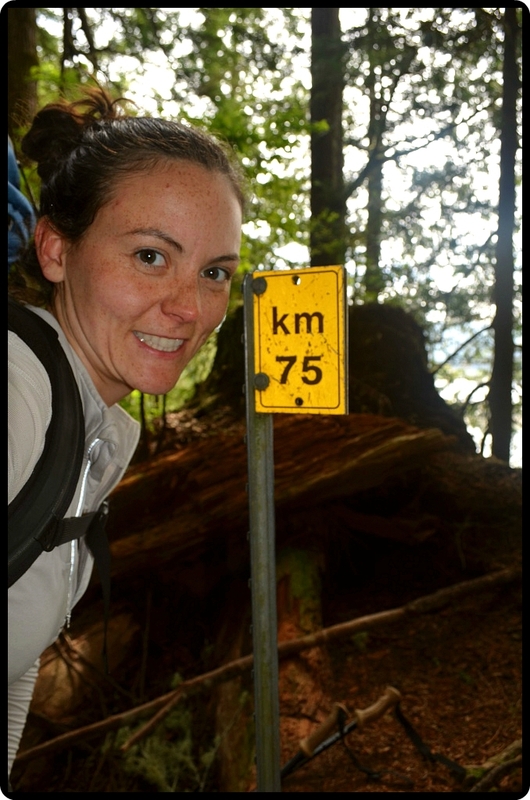 And two days later I got to relive all my moments along the trail sharing advice with a bus load of excited hikers making their way to Bamfield to begin their West Coast Trail experience. As happy as I was to see my car waiting for me, I found myself wishing I had my pack to begin all over again!